India is a very important market for the German textile machinery industry, with an export of more than €255 million (+ 8 %) in 2017. Many German machinery builders have longstanding relations with Indian customers and quite a number of them also provide production plants and training centres in India. Not surprisingly, about 370 decision-makers and experts from the textile and nonwoven related industry attended the VDMA conference and B2B event called “German Technology meets Indian Textiles and Nonwovens” in Mumbai on 15-16 May 2018 (www.germantech-indiantextile.de). According to a survey, both the event and German textile machinery engineering received the highest marks among the visitors. About 57 % of the visitors stated very good and 38 % good experience with machines and components from German suppliers. The performance and service promise as well as the high-quality standards have made German machine suppliers as most reliable partners in India and other countries. This positive result has by far not been reached by any other manufacturing nation from Europe or Asia. Asked for future processes, investments in technical textiles and/or nonwoven production seem to be the most favorite sectors in India. Around 74 % of the visitors plan to expand their production capacities with new machines and components whereas 26 % intend to replace old machinery by new machines and components. High productivity, after-sales service, end-product quality, low operating and acquisition costs are the decisive machine procurement criteria in this order. The investments plans are based on a positive business and investment outlook in India. 45 % of the visitors surveyed plan to invest more than 10 % within the next 12 months and 30 % up to 10 %. 25 % of the visitors expect a sales increase by more than 10 % for the next 12 months and 60 % anticipate a sales growth of up to 10%. 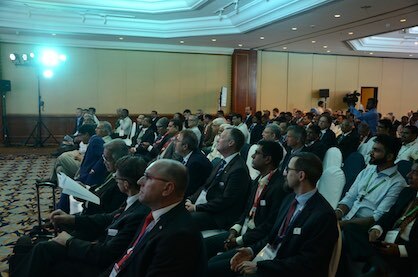 Considering this positive business climate and the high interest from the Indian industry, the 32 well-known VDMA members participated in the conference have good chances to offer the right technologies and to place new orders. The presented technology topics along the entire textile value chain will help the Indian industry to fulfill their expansion plans and to meet the challenges such as rising salary costs and shortage of labor in industrial regions. Whereas the event on 15-16 May 2018 focused on customers, a training session at the prestigious Veermata Jijabai Technological Institute VJTI in Mumbai on 17 May 2018 was addressed to future engineers. More than 220 textile manufacturing and mechanical engineering students followed the technical presentations. The VDMA's contribution to improve the education of future customers and partners was very much appreciated. The VDMA Textile Machinery Association and VDMA India Office cordially thank all media partners and supporting Associations involved (see www.germantech-indiantextile.de). In 2018, the Association’s next sales supporting activities take place in Belarus, Brazil, Uzbekistan, Iran, China and Egypt. A. Monforts Textilmaschinen, ANDRITZ Kuesters, Autefa Solutions, Benninger Zell, Brueckner Textile Technologies, DILO Systems + TEMAFA, Lindauer Dornier, Erbatech, Erhardt + Leimer, Festo, Groz-Beckert, Interspare, IQ-SPS, Karl Mayer, Küsters Textile, Lenze Mechatronics, Mahlo, Mayer & Cie., Neuenhauser Maschinenbau, Oerlikon Textile, Reseda Binder, Saurer, Sedo Treepoint, SETEX Schermuly textile computer, Texpa Maschinenbau, Thies Textilmaschinen, Truetzschler, Truetzschler Nonwoven & Man-Made Fibers, WEKO Weitmann & Konrad, Welker Vakuum, ZSK Stickmaschinen.